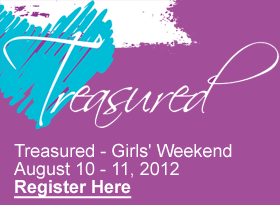 Treasured	...A Weekend Event For Teen Girls to benefit the young women in the Tampa Bay Area, will take place in Larg on Fri. and Sat. August 10th, and 11th, 2012, at Hope Church, located at 7100 142nd Ave. N. Largo, FL 33771. Presented by Southeast Region Open Bible Women's Ministries, a ministry that encourages women of all ages to reach their potential in Jesus Christ by loving, living and leading as women of influence. Hosted by Jeanne Rogers (Women's Ministry Director of Southeast Region Open Bible Churches). Special guest speaker...Mayra Gomez ( Founder of TruModel and Model4Jesus). We are beyond excited for what is in store for you this year at Treasured! The theme for this year is "I LOVE YOU" and we together are going to experience a Treasured PROM like never before. We want to remind you this year that 'You Are Loved' and that each one of you are truly a "PROM DIVA" (Divinely Inspired Virtuous and Anointed). For the first time in Treasured history, we will be hosting our first TREASURED PROM! Come dressed in your finest prom dress to the service on Friday night to experience prom like you never have before. There will be prizes for most colorful, most creative and of course, most bling! You will NOT want to miss this fun evening! We encourage you to go and get your friends, neighbors, relatives, classmates, etc. and bring them along with you to this Treasured experience you will never forget. P.S. You can wear a regular dress if you do not own a prom dress! 7:00 p.m. Worship and " PROM"
Registration is $25 and it includes Lunch! !